Every car has some kind of history whether short or long. Since this car has survived 54.5 years (built in October 1956) and we have owned it for well over half of that time, I can give some of its history. 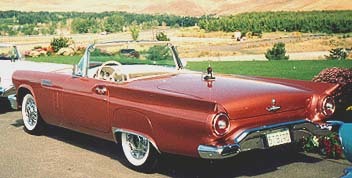 The car was originally Thunderbird Bronze. 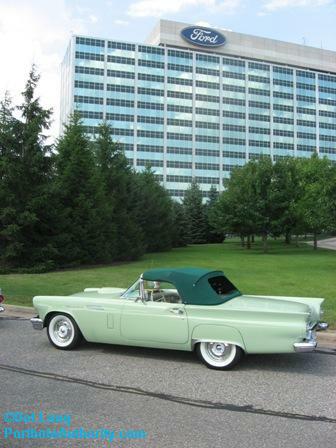 Though we have changed the exterior color, the interior has been kept like the original - all white - a fairly rare option in 1957 but well-liked by restorers of today. 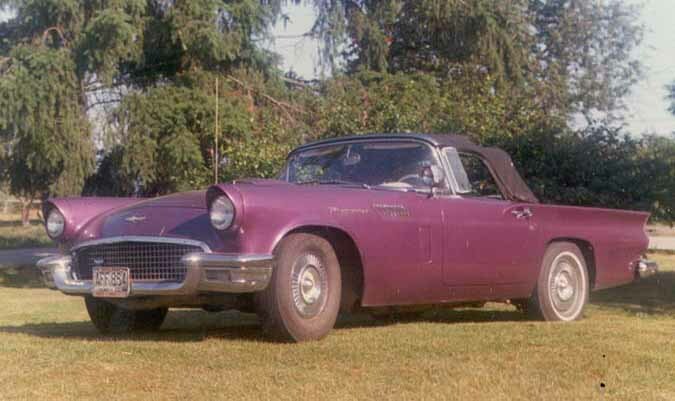 When we bought the car in the summer of 1975 from its second owner, the car was purple with black seats and black canvas soft top along with the original white dash and visors. The previous owner had tired of cleaning the white seats. We left the exterior purple for about a year before changing it to '69 LeMans or Corvette Blue. The soft top was replaced with a white vinyl. The seats stayed black for 10 more years. We added the '66 Mustang "Styled Steelwheels" and used them for several years. Update2011: Mattel's Hot Wheels came out with a metallic blue with white top 57 this year in their Decades series. Fairly good match to ours other than the added graphics on the 1/64 scale model. In 1988, we decided the car needed a new paint job so we contracted a friend of ours to do the painting and some bodywork. About a year and a half later, after a body off restoration, the car was back on the road. 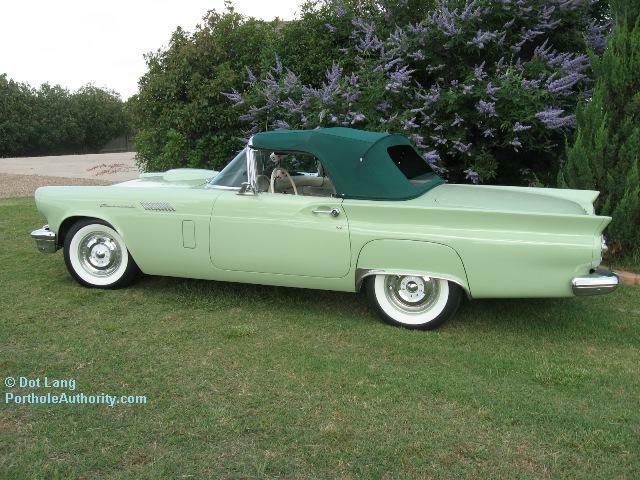 This time adorned in the beautiful '57 Thunderbird color of Willow Green. The seats are still the same from 1986 (slip covers have helped a lot) and we're still using the original sun visors though they do need replacing. The dash has been replaced twice since we've owned it -both times with white. We finally started using the fender skirts which had come with the car. The background picture was taken in April of 1990 on the coast of Washington State. The Rhododendrons were just beautiful at that spot that year and we couldn't resist the chance to take the picture. By The Way, a similar photo of mine was printed in the 2002 Thunderbird Calendar by BrownTrout, month of May, taken at the same location. Yes, it's part of my memorabilia collection. In 1993, we moved to Texas where the car now resides. Isn't it amazing how different the car looks with a new top. We had this top installed in the summer of 1999 and the car made its debut at the Witchita, Kansas CTCI Regional at the beginning of July, 1999. This is a marine canvas soft top - the only way we could get close to the collor we wanted..The top color is hunter green. We love the top color so much that the top is rarely down now. By the way, we finally bought new white sunvisors for the car in 1999; the original ones had been dripping foam on the dash thru the cracks in the vinyl around the mounts..
Next project may be the engine rebuild which George is in no hurry to do. The engine has been holding up fine with over 120,000 miles since the heads were rebuilt in 1975. It appears that the base block in this car is still the original since this car only had 106,000 miles on it when we bought the car in 1975. Car still had original carburetor which has long since been sidelined. The leaky rope seal in the 312 was replaced last spring with a modified Mopar neoprene rear main seal. If you would like to know the modification process, visit the late Walt Nuckels site, however a new seal has been manufactured that does away with the need to build your own seal. A switch to synthetic oil was also made a year ago (2000) so we know the seal is working great. 2004 ~ The engine rebuild was completed last year but with a very hopped up cam. Alas, too hopped up, and the gas mileage dropped by 6mpg & no longer starts quickly, so it's due for another overhaul back to the original cam & block. The seat covers are getting old now and due for renewal. So that will be another project soon. 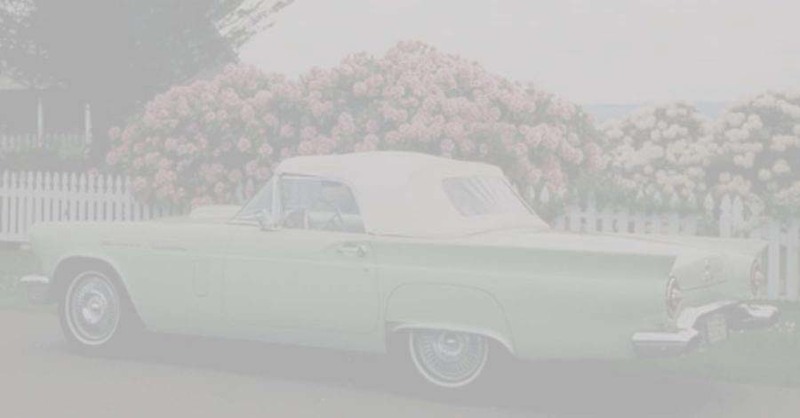 Keeping an old car up is an ongoing process, particularly when it's driven all the time. It will see many miles this next year. 2009 ~ The hopped up cam was replaced back in 2004 within weeks of the rebuild being finished. The seat covers are still the same. The car is still driven anywhere from 2000 to 8000 miles each year. This year is a short year as our longest trip was to Tulsa, OK for a CTCI convention. This year, we also replaced the green year of manufacture WA plates with cream colored year of manufacture TX plates as TX is now its permanent home. Our children still live in WA so don't even think about asking if the WA plates are available for sale. 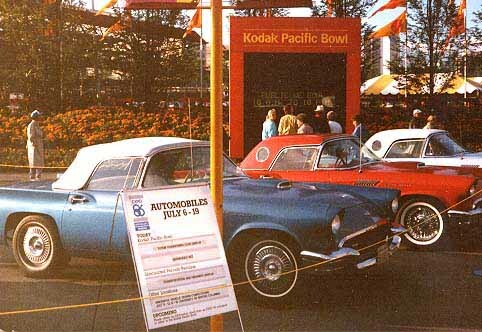 While at the Tulsa meet we were honored by our peers with "Most Popular Display Thunderbird"
Photo at left was taken at Ford's World Headquarters in Dearborn, Michigan last summer at the 55th Thunderbird Anniversary in late June, 2010. To go along with the new look, my spouse also took off the full size hubcaps as one kept coming off on the road. He replaced them with the small standard 57 Ford Hubcaps and added chrome beauty rings so it still has the full chrome look to the wheels. The added benefit is that these small hubcaps don't come off like the full size ones do. We have added another Thunderbird to our stable, the 2002, in 2002.. To read our story about this new car and see pictures, please visit my website at Porthole Authority formerly The New Thunderbird. For a review of the New Thunderbird website, read here. If you have a new Thunderbird of your own, you may want to participate in an active forum at the Thunderbird Nest. Since 2002, we added a third Thunderbird, this time a 2005 in the color Inca Gold. 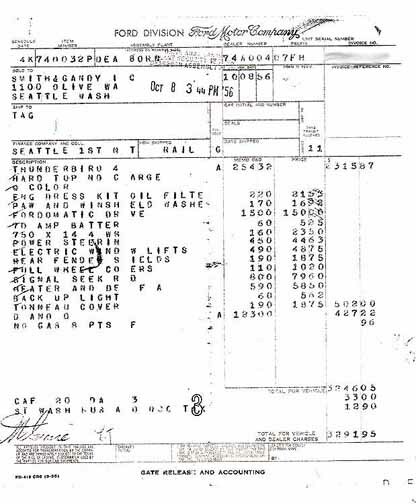 More on that car and the color on PortholeAuthority. Bonus Page!!! - Where did I get this fixation for Green? Meet our 54 year old Station Wagon. 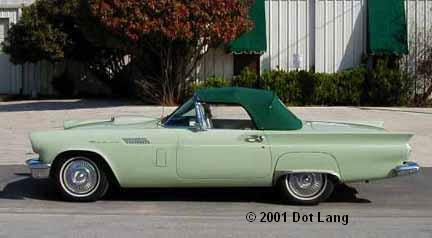 When we bought our 57 Thunderbird, I really wanted to paint it Cumberland Green but was informed that that color was not available for the Thunderbird. 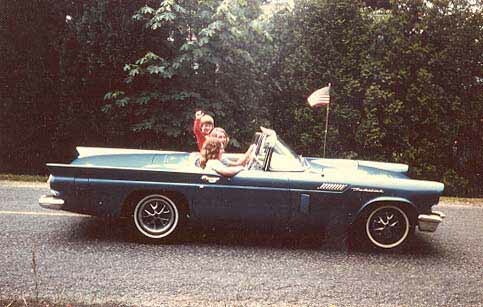 Our Thunderbird may not be "concours" original but it is a stock color for the Thunderbird. My feeling was that since the car had already been painted a non-stock color when we bought it, there was no driving force to stick with the original color but I wanted to stick with a stock color. I'm rethinking that but the 22 year old paint job is holding up quite well with care.